As a young advertising copywriter and aspiring photographer, Bob Rehak took the “L” to work at the Leo Burnett agency downtown. From the train, he’d look down upon a section of Chicago that was a microcosm of the city during a time of great political and class transition. Determined to document the neighborhood and its people, one day rehak got off the train and descended the steps of the Wilson platform and began what became a collection of over 5,000 black-and-white photos, capturing the essence of Uptown in the mid-70s. Many of his photos feature gang members, derelicts, immigrants, and others marginalized by society. “Yet they were some of the most wonderful, welcome people that I’ve ever come across,” said Rehak. When he asked to take their picture, they usually agreed eagerly and posed in situ, often with ruined buildings in the background or walls covered with graffiti. Through his portraits of the people of Uptown and how they lived, he was able to create a portrait of the neighborhood. One photograph featured the firehouse near the corner of Wilson and Broadway. One of the firefighters noted that during the mid-70s his unit was called out to as many as 400 fires a year, many set by arsonists. Uptown during that period had the busiest Fire station in the nation. Beginning April 26th at the Wilson Abbey in Uptown Bob Rehak will display 13 signed AND numbered prints from his collection. A reception will take place Friday, May 2 from 6 p.m. to 8 p.m. at Everybody’s Coffee, 935 W. Wilson, Chicago, Il 60640. the prints, in 16 x 20 and 18 x 24 inch frames, will be on exhibit until May 30th. Artwork will be for sale. Own a piece of Uptown’s history! Bob Rehak will be available for interviews. Please arrange them through his website bobrehak.com. Rehak’s website also contains links to his coffee-table book, Uptown: Portrait of a Chicago Neighborhood in the Mid-1970. The book was featured on WTTW Chicago Tonight, WGN, THE CHICAGO TRIBUNE, DNA INFO CHICAGO, UPTOWN UPDATE, COMPASSROSE.ORG AND other Chicago media outlets. 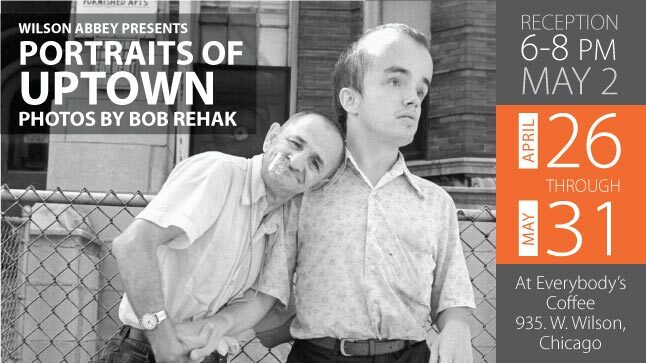 Since publishing the Uptown images on his photoblog, Rehak has reconnected with hundreds of the people he photographed 40 years ago. As of the end of April, his blog has received more than 7 million hits since he began posting pictures of Uptown last August. This entry was posted in Openings and Events and tagged Bob Rehak, Chicago, photography, Wilson Abbey. Bookmark the permalink.